The variable area flow meters are the most cost effective solution for almost all applications involving the measurement of industrial process liquids, gases or steam. ABB´s variable area flow meters are reliable, flexible and simple. The rota meter is most commonly used form of variable area flow meter. It consist of vertical tapered tube with a float which is free to move up or down within the tube. 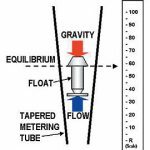 The tube is made tapered so that there is a linear relationship between the flow rate and position of the float within the tube. The tube is mounted vertically with small opening at the bottom. 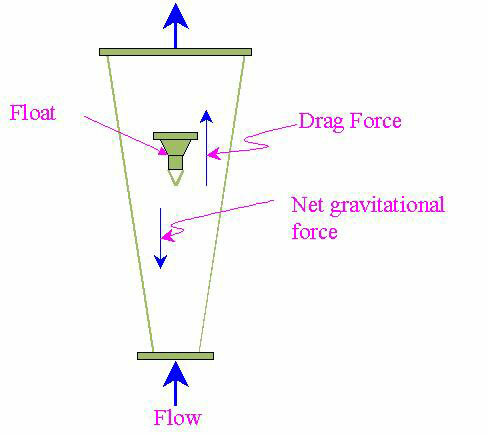 The fluid to be measured enters the tube from bottom passes upwards and exists at the top. 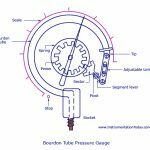 The tube is made up of glass so as to identify the positions of float inside the tube. In metal tube, a pointer and scale arrangement can be provided.